Unusually there is a Monday report as we dealt with a couple of opportunities. Mick Thomas hosted a customer on behalf of Network Rail with an ultrasonic trolley. All was well and the customer was pleased with his investment. 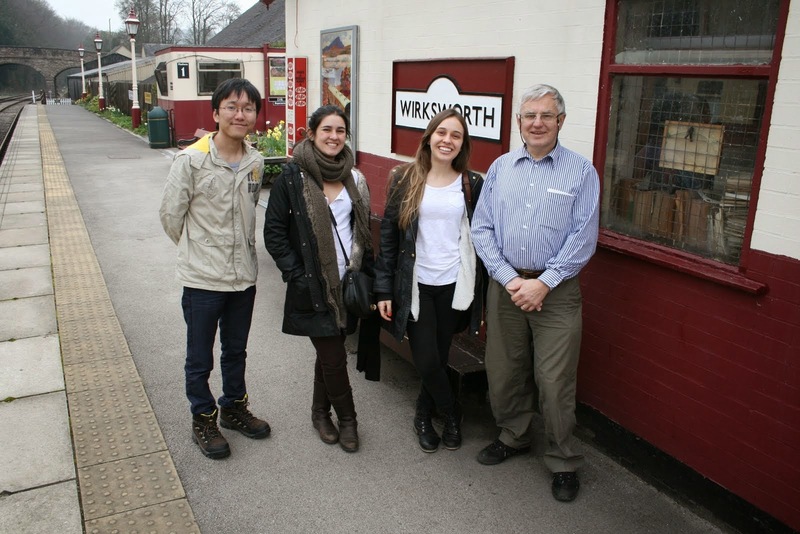 We also welcomed Felix Schmid from the Birmingham Centre for Railway Research and Education with three of his students, two of which will be undertaking a project based at our Railway. Their photo appears with Felix, the two students from Brazil who will be working with us and a student from China who appreciated a briefing on our low-tech approach to life. Mick explained our systems and Maria and Thais will be with us from time to time as their project is to automate the Shottle loop with all its applications on rural branch lines. So in the photo is Felix, Maria, Thais and Dewen. It is really great to think we are part of the world wide web of railwaymen - can't bring myself to say "railway persons". completed a delightful experience of the narrow gauge and will soon be running an express service, almost as fast as a man can walk. The Passenger Department continued with the joy of stuffing and only a small shedload of this charming task is still to be done. Outside Lynette dealt a blow to the weeds of the west embankment and Anne created a new feature at Duffield, which fine work is illustrated here. the Booking Hall as smoothly as a ship at sea, possibly the Hesperus. Meanwhile, the DMU team ripped out more orange Formica and spent the entire day being frustrated by a windscreen wiper. four o'clock. We entertained both steam and diesel experience guests to very nearly ecstatic reviews and much chuffing around attracted a number of visitors giving the buffet quite a shock. Down the yard, the LMSCA wittled their way around their Third Open and only a modicum of doors will see this vehicle watertight in a very soon moment. 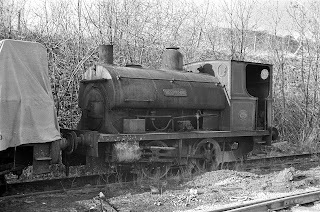 The Station Foremen attended to a range of Complete Railway Aggregate Products dumped around the museum and brake van display, including enough oily rags to set fire to a small town, preferably not ours, and these have been properly filed in the bin marked "Use This Not The Floor: You Are Not At Home Now". The Booking Hall, assisted by the said Foremen, spent the day dealing with the second quarter of the AGM mail out and numerous postmen will be spreading the joy of the Annual Report to you all over the next few days. A little light relief to celebrate the first steam experience day of the year which shared the day with the diesel experince team. Many thanks to Lewis and Richard who entertained the diesel clients and Neil, Dave and John Ball who looked after the steam customers. A day when it would have been much better to stay at home - wet, cold and miserable. 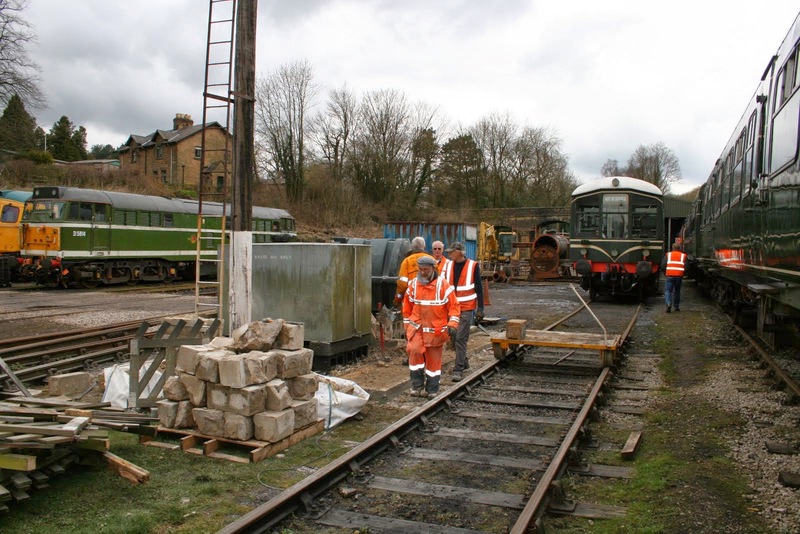 Nonetheless, hardy souls reorganised the stock at Wirksworth to make best use of the space available and prepare for tomorrow's experience days that involve both steam and diesel. The remaining section of the line between Shottle and Idridgehay was patrolled and down at Duffield station signs were painted and further work on the station seats was accomplished. The M1M were in evidence and the soul destroying envelope stuffing continued resulting in the despatch of the first tranch of Annual Accounts leaving us for shareholders. Leigh and Tom joined Trent Barton for the launch of the new look "Sixes" in Derby Market Place with Tom's photo attached. They are certainly doing us pround in the supporting literature. The Pullman Buffet Car and Booking Hall continued to generate revenue as the new season is kick started into life. A contact of Hylton has found a couple of very interesting and unseen photos which I have also attached. They are credited to John Clayson. A bitterly cold day that tested the resolve but the PWT kept going with their demolition project which is all part of the grand plan to eventually provide enhanced maintenance facilities. Roy and Les who constructed the fuel and waste oil area will, I hope, forgive the removal of their work. The wall is now mostly demolished and the blockwork stored in various locations, the remaining diesel in the tank has been emptied into L J Breeze and the power disconnected from the fuel pump and the northernmost lamppost. A photo of the destruction is attached. The second of the Bluebell two returned today and the LCC, without assistant, tended to the two car set assembled for next Saturday. The LMSCA achieved the second and final coat of roof paint on their Third Open and concentrated on preparing the doors for refitting. The Pullman Buffet Car looked after a number of hardy visitors including the hauliers that had returned the second dmu car. The Booking Hall continued to seek customers for future services and will enjoy a day away on Derby's Market Place to assist Trent Barton to relaunch the "sixes" that have a splendid bias towards our Railway. There would seem to be many goodies on offer so if you are in Derby tomorrow give a little support to the EVR team. The wonders of the world wide web reminded me of the tasteful livery that all our stock should carry - happy days! 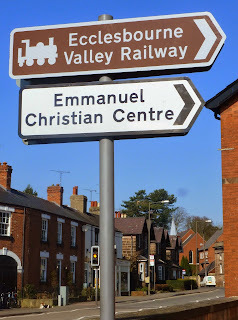 If this all works you will see a photo taken by Eric Hills of a "brown sign" erected at the entrance to Chapel Street, Duffield which represents a considerable triumph for Anton and has taken a very long time and determination to achieve. The day has been dank and fairly miserable leading to very damp track patrol teams that have dealt with Wirksworth to Idridgehay and Shottle to Duffield leaving the remaining section to be dealt with later in the week. The VCT made further progress at milepost 1341/4 and then tended to an appeal for help dealing with a tree that threatened the path running past Duffield station. Ownership of the tree was questionable but as a gesture of mutual assistance to the Parish Council the team successfully removed the risk of injury to passing pedestrians and our thanks are due to the four man team fielded today. 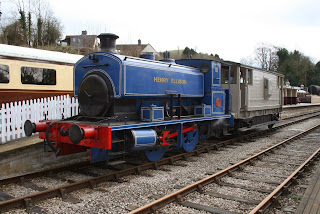 The first of the Bluebell returnees arrived this morning with the second arriving tomorrow. 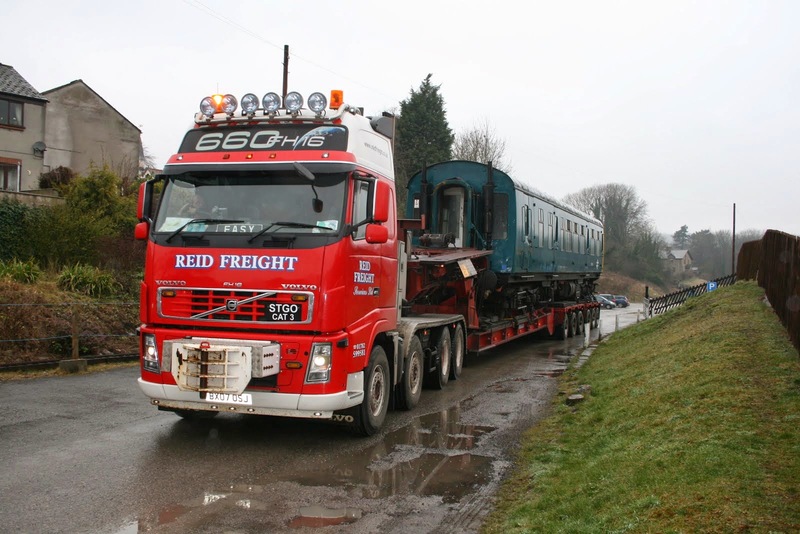 Railcar Enterprises took quite a risk in releasing the two vehicles to Bluebell because of the distance of travel needed to resolve any emerging problems in an environment that has long held out against the internal combustion engine. 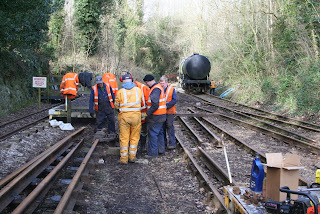 Nonetheless, their final day with Bluebell as part of the first ever diesel gala on an otherwise dead Friday in March generated over £8,000 in fare revenue and generated much encouraging comment for our enterprise. The SBT occupied a mini digger as the end of their great endeavour draws to a conclusion and the LMSCA attached covers for the corridor end connections on the Third Open and applied yet more paint to the vehicle. The DST readied Henry Ellison for its first driver experience of the year this Friday and firstly applied pink primer to Cathryn which was not deemed manly enough although she is a lady. The frames are now battleship grey! Their main tasks were the dismantling and refurbishment of the helical spring and leaf spring suspension components. The area of the smokebox floor is receiving "radical treatment". In passing, the team are exploring the concept of nuclear power for the locomotive and are of the view that when not in use it could supply the electrical needs of the town and I am delighted that such radical thought is occupying their minds.It's what preservation is all about! 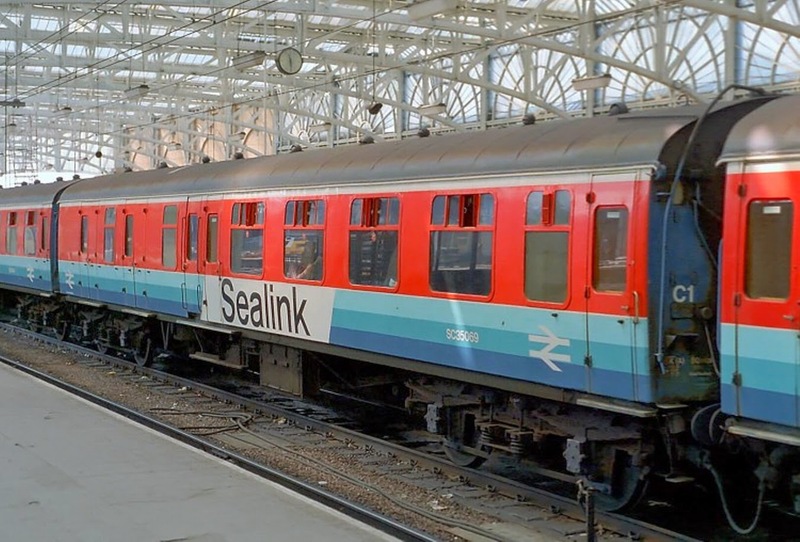 The dmu team have been stretched as they put together a "scratch" two car set to deal with next Saturday's group demands and began shunting various stock to facilitate Friday's driver experiences. The PWT patrolled the Duffield to Shottle and Idridgehay to Wirksworth section and commenced the demolition of the fuel store bunded area necessary for the realignment of track as part of the grand project to improve the Maintenance Facility. The fence has now gone together with around one third of the wall. The Pullman Buffet Car had a steady day and the Booking Hall tended to a range of enquiries together with a start on the laborious stuffing of envelopes with the Annual Accounts for shareholders. Lastly our congratulations to Bob and Mave Gibbens and Rod and Mary Birch who celebrated wedding anniversaries today. 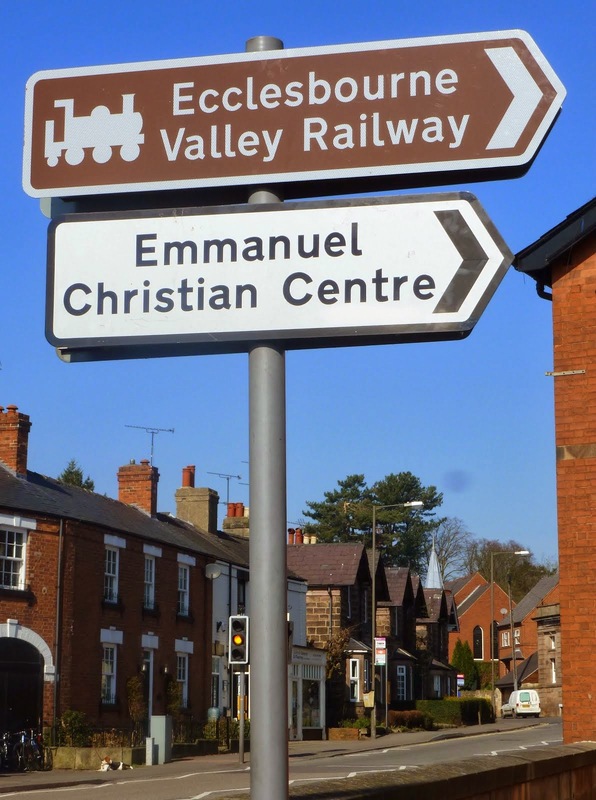 Both couples have enjoyed a long and happy marriage obviously enhanced by their association with the Ecclesbourne Valley Railway. PS - Many thanks to all who promoted and delivered last weekend billed as an Home Fleet Gala - great feedback that we delivered something that satisfied our customers. It certainly helped the bank balance! A most pleasant and often sunny day with the occasional twinge of hail and the odd shower. We were delightfully busy with the first main event of the season, and I would like to thank everyone for making it such as success, it being a model example of the Air of Publicity. on with assorted cab fittings to unit 50253, as well as windows and the heartening process of stripping out that foul 1980s orange Formica which is such a festering plague on heritage railcars. season, that we issue Operational Orders for the enlightenment and thoughtful control of our operations and for the care of our passengers: reading them diligently is your job because should you not know what you are doing we may possibly regard you in the same way as we regard orange Formica. A good start to our homefleet gala as the 3 car and 33035 worked between Wirksworth and Duffield , 55006 and 55012 served the Ravenstor line and Breeze was employed on drive a diesel on platform one and had a staring role on radio Derby . The 5 inch and model railway looked after the smaller visitors to the railway. The Pullman buffet was kept busy serving plenty of bacon butties as well as looking after the birthday party. The Dmu group completed further restoration work on 50253. The 8f group worked on drilling out the stays on Kathryn as well as helping Oakes enterprises with further work on the Duke. Anton was kept busy sorting a power supply when the whole of Wirksworth lost its power supply. All in all another good day with loads of praise for the staff from the passengers. Many thanks to all who worked hard to make this a special day. LMSCA thundered along, and nearby the EVRA CK had its door backs attended to. All the vehicles for use over the coming weekend have been inspected, the usual finishing touches of clean antimaccassars applied, and our signature smell of Lilly of the Valley now pervades many a sparkling compartment. The station staff, whose inspection regime is very nearly regimental, have been to Ravenstor and cleared the paths ready for its first day of use this season, and around the station at Wirksworth everything which could be polished has been polished. The crossing trespass guards have been replaced and renewed; and as well as repairs to the collapsed south carriage siding footgate, the Station Foremen also frightened the Mess Room floor with a large application of Flash. After the excitement of yesterday the more mundane tasks were dealt with through the day which was cold and gradually deteriorated into dampness. The PWT gathered up the last of the gold ballast resting on the Wash Green Dock, loaded it to the RUDD and discharged onto the re-laid sections north of Cemetery Lane bridge. After fettling and boxing up this area is now available for use dealing with part one of the grand plan to remodel Wirksworth Yard for expansion of the Maintenance Facility. 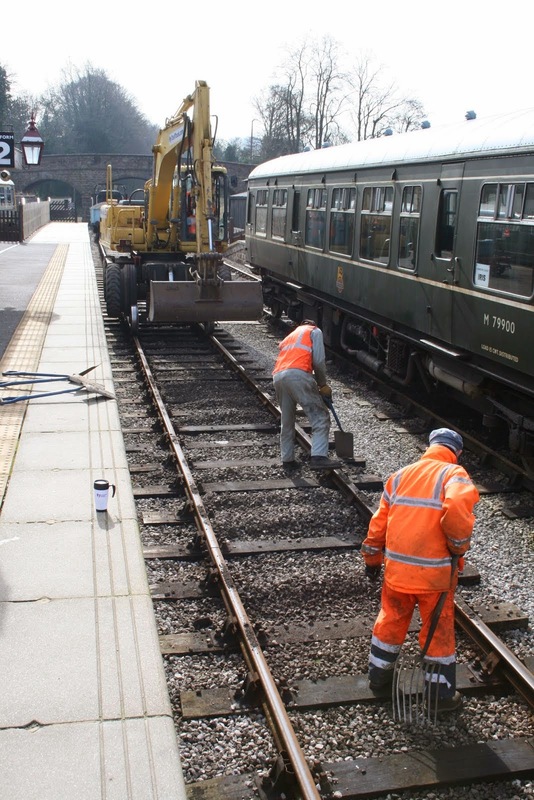 The LCC was gainfully employed removing moss from fencing at Wirksworth Station whilst her assistant applied gloss to the Training Room double doors as this project draws to a close. The dmu team had a varied day as they moved stock into position for the upcoming Home Fleet Gala and repaired 55012 so that it can go both backwards and forwards. 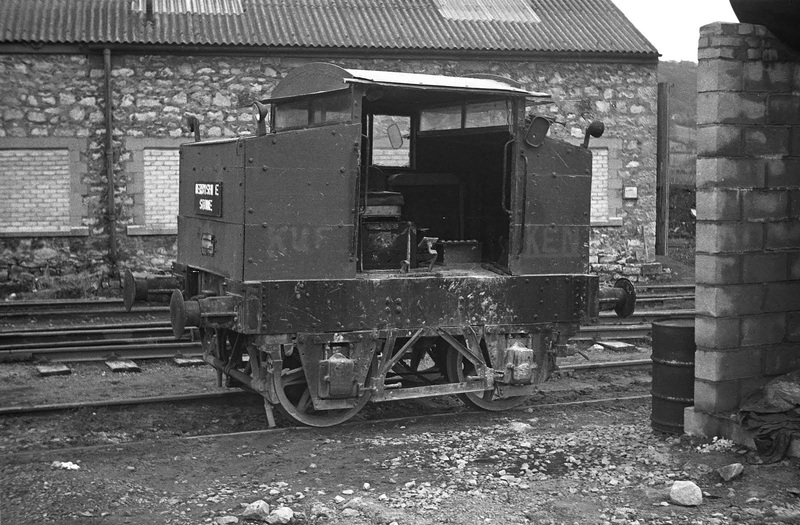 This forms part of the plot for the weekend with two "Bubble Cars" operating the Ravenstor services. Many thanks to John Allsop and Mike Evans for improving the main customer entrance doors to the Pullman Buffet Car. John had sourced a look alike Pullman Umber paint from Wilkos which lessened by some miles the cost of this project. The Pullman enjoyed a trade in cooked breakfasts brought on by the cold wind and the M1M tended to the EVRA CK to make the interior of the vehicle fit for the weekend. Ben Field's Bike Ride is Queen Elizabeth Grammar School, Ashbourne to London, totally 165 miles. Today has majored on our contribution to Sport Relief as the hosts for a train pull. It has taken a long time to gestate but today saw a large contingent from Network Rail haul Iris from Wash Green into Platform 2 and then do it again. All went extremely well from our point of view with BBC East Midlands Today being in attendance with first mentions of the event already being screened. 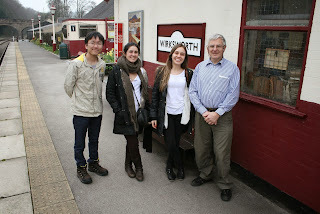 We also welcomed the Derby Telegraph and Rail Staff Magazine which will all help put Wirksworth on the map. Many thanks go to Tom Tait and John Evans who coordinated the event on our behalf together with Mike Evans and Ollie who ensured that Iris followed, but did not overtake, the pulling team. The LCC's assistant gave the Training Room doors an undercoat whilst the LCC turned her attention to the Mark 1 SK. The LMSCA continued the long process of returning the Third Open to service and at Duffield seat painting continued. The PWT continued with their task of jacking, packing and levelling the work achieved north of Cemetery Lane bridge and this area has benefitted immensely from their ministrations. The SBT have made a great deal of unreported progress on their marathon task of refurbishing Shottle Station platform and I was pleased that so much thought has gone into minimising the area that we will have to fund tarmacing for. 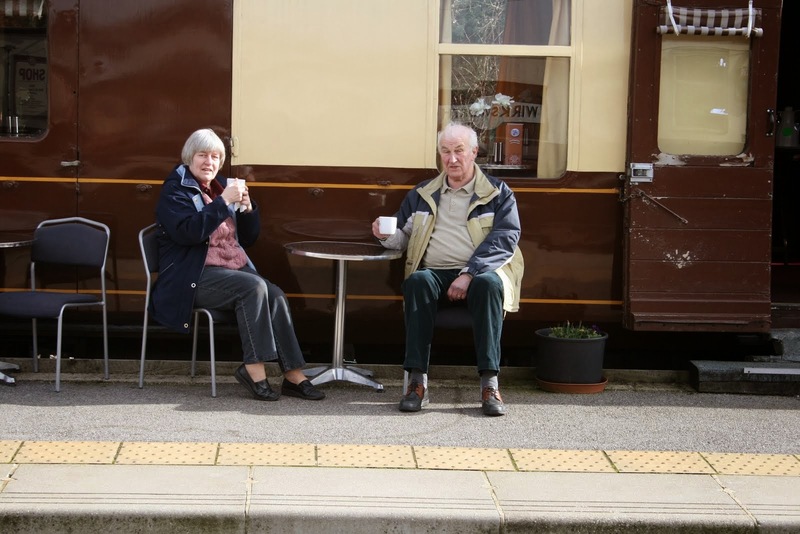 The Pullman Buffet Car opened early to feed our visitors and the bacon butties were well received. The Booking Hall also benefitted from the number of Sport Relief visitors and managed a couple of group bookings as well. 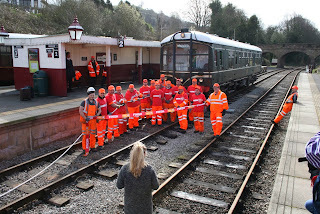 The sun was out for the event and the rest of the day enhancing this first ever train pull at Wirksworth - who would have thought! It's so economic with zero fuel consumption. A day of heavy showers, a little sun and a cold wind that didn't dampen the range of activities which required much interdepartmental co-operation. 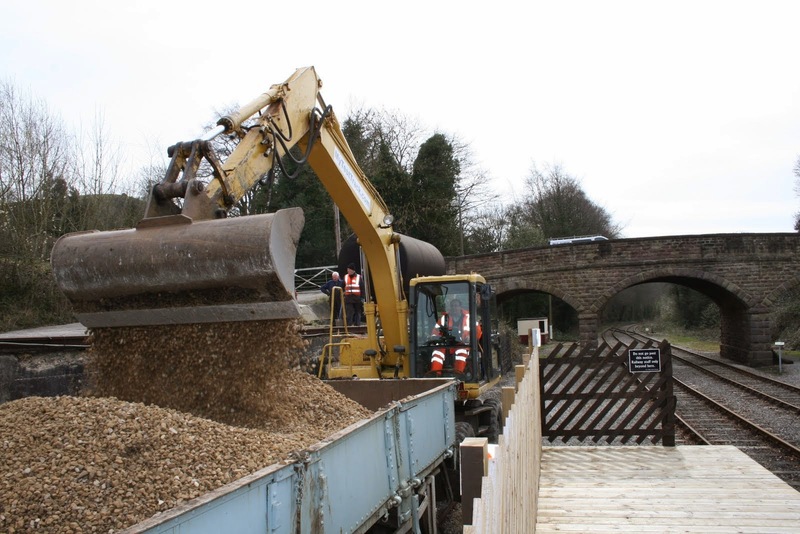 Away from the stress of Wirksworth the VCT and SBT worked in harmony to deliver "pre-owned sleepers" that will edge the Shottle platform side to create a gardening opportunity and minimise the amount of tarmac surfacing required. The VCT then carried on their work near MP 134 1/4 reporting one good fire and a team of six. The PWT had a day that was somewhat interrupted by activities in Wirksworth Yard but, nonetheless, made good progress with the two sidings north of Cemetery Lane in conditions that were less than ideal. Equally the dmu team had to deal with heavy showers whilst cleaning Iris for her starring role tomorrow and shunting various items to assist the DST to achieve their objectives. The DST had a training day with Henry Ellison and experimented with a routine that may be used with the driver experience season that recommences at the end of next week. At Duffield the cabin roof was sealed and painting of seating continued. The LMSCA achieved the construction of more roof hoops for the Third Open and restored the seating in their Mark 1 SK for the upcoming Home Fleet Weekend. The south weighbridge electrics were completed enabling the building to be used as a workshop to support station maintenance projects. Filing Fairy 2 completed the move to his new location and made further inroads to volunteer records. We were pleased to welcome a walking group from Wellesley Castle who had pre-booked lunch in the Pullman and were quite obviously delighted with their time at Wirksworth making a contribution to gift sales in the Booking Hall. The Multicar's battery was returned revealing that the winter had taken its toll on the vehicle which will have to be tended to by the Station Garage before commencing this year's weed treatment programme. Here attached are the details of my presentation, Steaming to the End the last years of B.R. steam on behalf of the Mickleover Model Railway Group, at Mickleover Royal British Legion, Poppyfields Drive off Western Road Mickleover on Thursday March 27th at 7 - 30 admission is £3 refreshments are available and there is a large free car park. If you know of anyone in the area who you think may be interested to come along please feel free to pass this email on to them or get them to contact me at my email address, mike.dawson713@hotmail.co.uk . 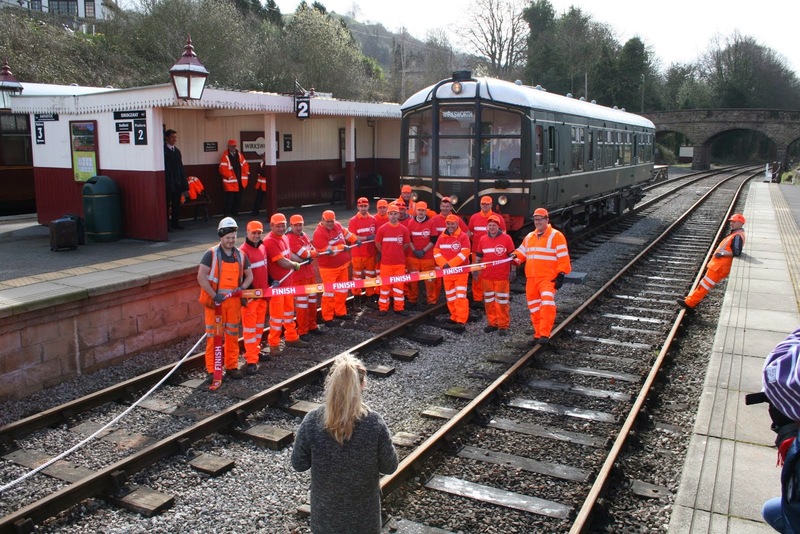 PPS - Sport Relief Train Pull tomorrow morning at Wirksworth at around 1000 - all welcome to cheer the Network Rail team on. The vast improvement in the weather, of almost two weeks of consecutive sunshine, has seen the pulse of the railway quicken, and the new season is about to be upon us. The passenger service had a modestly successful day, as did the buffet, with many visitors looking around, and with a surprising number of them "on holiday". extensive painting of the Austerity, not only of frames and wheels but of many other parts. Close by, Purves Jenkins Enterprises also got some paint very close to the CHPR water carrier before turning their attention to tidying the car park, ready for next week's Home Fleet Weekend. The Duty Conscript also did some car park clearance, and this being the start of the season, a polite reminder that things abandoned in the car park will be removed, burnt, scrapped, sawn up into very small pieces by boy scouts or eaten. A considerable amount of gardening took place, we entertained the guerilla gardeners, the station embankment got a good weeding and the platform 1 flowerbeds also received attention. Final items of detritus left over from the removal of the former south platform foot crossing were disposed of and the carriage watering pipe duly buried. The south end of the station is now back to its rightful condition. The Training Room roof received a second coat of bitumen paint in order to deal with its inscrutable leak, and the balance of the paint was used to prep an assortment of potholes in station approach which will shortly be receiving a multi-million pound order of tarmac. strange parts known to many of us as "pre-used". Will the person who has the Training Room key in their pants please return it. A sunny but cool day here on Derbyshires friendly railway as the 122 Bubble car shuttled our passengers between Wirksworth and Duffield many of which where on holiday in the surrounding area and were looked after by John,Richard and Vince. 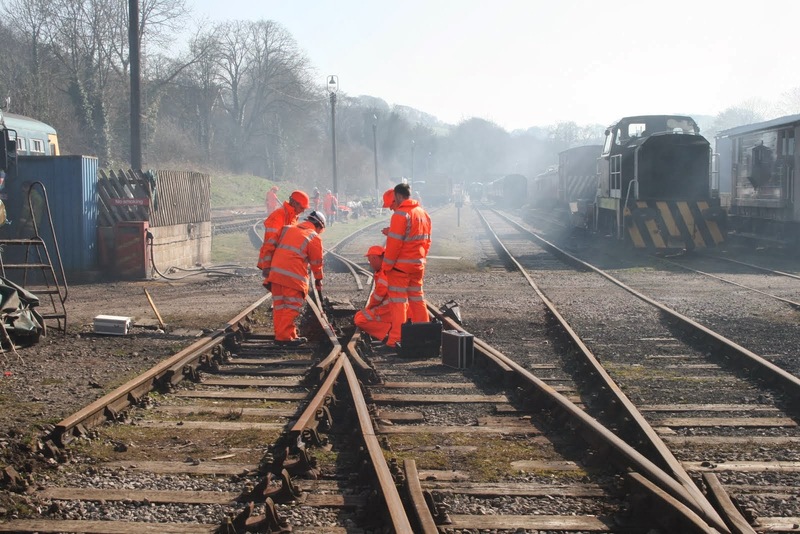 Wirksworth was a hive of activity as fire and first aid refresher practical shunting and customer service training took place during the day. The DMU group completed further work on 50253 and cleaned the three car unit ready for next week Home Fleet Gala the 33035 swapped places with 31414 and the pit being serviced for its starring role in next Saturdays line up. Peter ran a course on the narrow gauge. The 8f group drilled out more stays on the fire box of Katheryn and assisted Oakes enterprises with the Duke. The LMSCA completed further work on the third open as its restoration moves steadly forward. My thanks go out to Eric,John,Julie and Michael for looking after Fred one of our regular passengers after his slight accident today as it shows regular training pays off. A generally pleasant dry day here in the Peak District, we were happy to receive several guests for their Driver Experiences of our diesel railcar. This tootled down to Duffield both in the morning and in the afternoon. At Duffield various painting was being undertaken, and back at base the LMSCA were working on their various carriages with the main focus being on the renewal of the moquette in the SK, with a complete set of new red seats in each compartment on the way. pull, the Station Staff have been tidying up round Wash Green Bridge and have removed a large amount of various tat which had accumulated there. This part of the railway is now pristine once more and the grass has been mown round the Workshop. For those of you not familiar with this quality building I attach a photo of it, in its newly tarted up state, complete with a couple of temporary borrowed flower pots. I am told the flower pots contain a number of rare Petunias as well as some even rarer Euphoniums, which we have watered diligently. There has been a general air of joy and goodwill as a result of a long period of warming sun over our enterprise. The Class 31 31414 had a test run to Duffield to ensure it will perform its allotted task during the Home Fleet Weekend. This was largely successful but there was evidence that the long damp winter had an effect on the traction motors. As they warmed up all seemed to be well. This relied on the co-operation of the VCT who were working at MP 134 and had been already disturbed by Tuesday's activities. Their graciousness is appreciated. 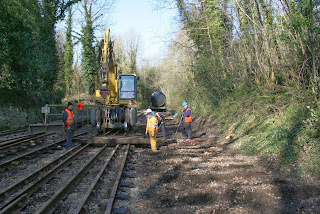 Amongst the PWT's work was the discharge of the RUDD of excavated track bed materials to the incline former siding area, refilling the vehicle with recovered ballast and filling cribs along Road 2 for the Sport Relief train pull and then ballasting up Road 2 again north of Cemetery Lane. 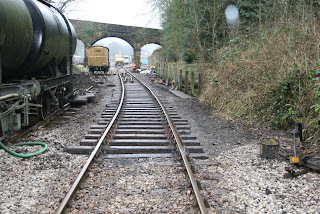 We now have two long sidings north of Cemetery Lane which will allow stock to be berthed there as the rest of the Yard remodelling continues. The M1M continued with their rewiring of the SO and SK. The Pullman Buffet Car entertained the passing trade with people dining at the outside tables in the warm sunshine. The Booking Hall welcomed today's guests with a few sales from their revamped sales area. Another pleasant and productive day. PS - Prices have been received for the majority of the PW materials required for preparation work for the Maintenance Facility extension which total £11,000 + VAT. An order will be placed in mid April provided we are confident that we can pay the bill. Another day today to reinvigorate us and help the Company's finances. It was day two of the Network Rail derailment investigation course enlivened by a late booking by our regular "walking stick" customers. What better shop window for their product than demonstrating it before a range of NR senior engineers - I have asked for a 10% introduction fee. I was admonished by the PWT for ignoring their progress yesterday and hasten to mention the activities today as they continue to rebuild Road 2 beyond Cemetery Lane following the removal of the pointwork there. 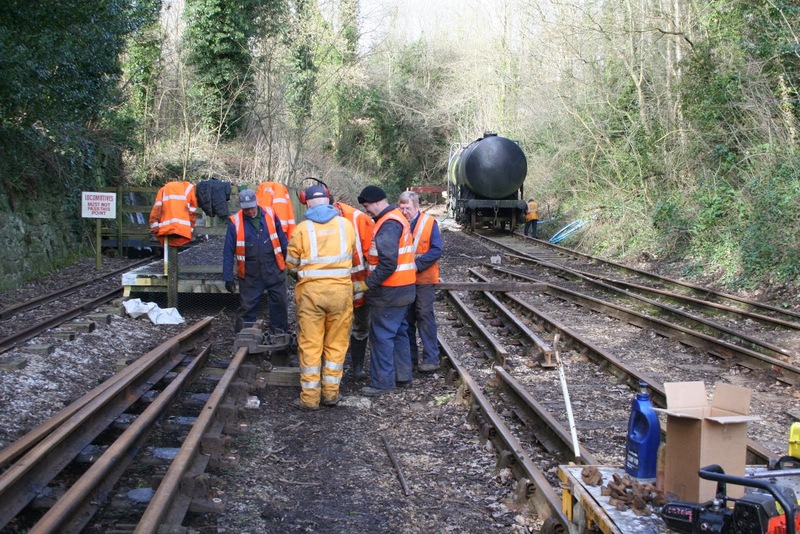 A photo from yesterday is attached that doesn't show Hylton tending to the tank wagon but shows the sylvan setting they have been working in. Yet more Network Rail folk undertook a final recce of the site to be used for the Sport Relief Train Pull next Wednesday. It promises to be quite an event with the first pull scheduled at around 1015. All are invited to support their efforts. 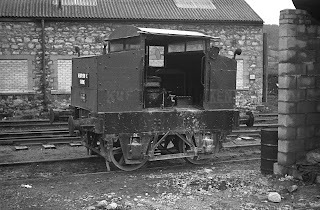 The LCC + 1 undertook a clean of the interior of the Met Cam centre car and the "Bubble". The LMSCA team of one made further inroads to the restoration of their Third Open. The Pullman Buffet Car benefitted from our various guests and the Booking Hall tended to the usual range of productive enquiries. It has been quite a day with the main event being day one of a derailment investigation course for a large team from Network Rail and all our other activities have worked around them to ensure their day has been productive. We also arranged a charter for employees that had seen service in Coalville ably hosted by the dmu team. It was good to welcome Fred & Iris who gave the Mess Hall its well needed cleanse and there was a wash of "Bubble Car" 55006 together with the servicing of its throttle cables after a few problems were experienced last weekend. The DST confirmed by trials that both small locomotives are fit for service and Cathryn's wheel and springs were loaded for refurbishment off site. At the south end of our line there had been preparation of signs and seats for the application of gloss today. In antiticipation of the start of the weed treatment programme the battery from the multicar was removed for charging. The LMSCA made further strides with the refurbishment of their Third Open and electrics were progressed to the southern weighbridge to allow it to act as a more productive workshop. The whole line between Duffield and Wirksworth was patrolled and the Class 31 had some repairs to its water hoses undertaken. The Pullman Buffet Car benefitted from today's customers and the Booking Hall received more income for our enterprise. Quite a good and productive day. of a repetitive leak problem: typically nowhere near the leak itself. Painting also spread as far as the frames of the Austerity. the Foreman and the Underforeman proceeded to dig it out. multi-million pound re-cabling of the back office telephone. Another cold and drizzly day on Derbyshires Friendly railway but even this failed to deter our hardened passengers from traveling behind 55006 which ran the daily Wirksworth -Duffield service with the help of Lewis , Richard and Andrew. Down the yard Graham , Ollie and Lewis assisted with vital checks on 31414 in its preparation for the up and coming Home fleet gala which will be held on the 22nd and 23ed of March . Leigh and Jake worked in the cab of 50253 as it progresses slowly to being ready for the multiple memories w/end.in Sept. The 8f group were busy drilling more of Kathryns copper stays out as part of her essential repairs..
Oakes enterprises were to be found preparing the Austerity tank loco the Duke for the refitting of her springs and eventually its wheels. The Lmca were busy working on the windows of the third openup in the shed. All in all another good day as we start our new season here in Wirksworth. 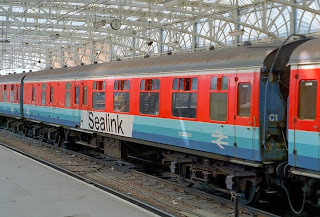 theme of the day appears to have been the application of paint, the Third Open having reached its 13th coat of paint; the station back office having received its first coat of paint in 14 years, and the SK receiving an application of seating compartment varnish, down the yard. The station resounded to the sound of planning, and more problem solving towards the irritatingly leaky Training Room roof. Iris received cleaner's attention and a great deal of measuring took place amongst the yard point work ready for a booked event next week. Today's stars are the Permanent Way Team for their activities north of the Cemetery Lane bridge at Wirksworth over the past couple of weeks. When we arrived on site this was a densely wooded area almost impassable on foot. Over the years the area has been cleared and partially re-laid but has always been wet and an area where trench foot was possible. Today's photos show how Road 1 is now in complete except for ballast representing a great tribute to the teams involved. This is all part of the preparatory works for the Maintenance Facility extension. The VCT concentrated on recovering more sugar stone from Shottle for use at their Hazelwood base. The dmu team undertook some useful shunting of stock and positioned the units required for the weekend. More interior painting of 55006 was undertaken as this vehicle will have quite a busy year. The DST fielded a lone member who drained Henry Ellison's boiler so that an errant wash out plug could be investigated after last Tuesday's trial steaming. My thanks go to the LCC and her earnest assistant who have washed down the back office in preparation for painting and a most generous offer of replacement carpet has been received. Phil Tarry's choice of "beige" did not deal easily with sundry activities that were seen during his reign! The Pullman Buffet Car has had quite a productive week and the Booking Hall has had further encouraging advance bookings. The arrival of Trent Barton's promotional leaflet also lifted spirits where we are pleasantly featured and included on their route map. Looking at the extremities of their network which includes Bingham, Burton and Leicester the Zig Zag Choo Choo seems destined for great success. Progress Wednesday 5th March 2014 - The Photo! Firstly we must congratulate the LCC and her faithful assistant on her birthday. 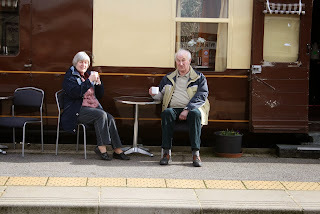 They are seen sampling one of our new exotic coffees outside the Pullman Buffet Car in the pleasant sunshine of the day. 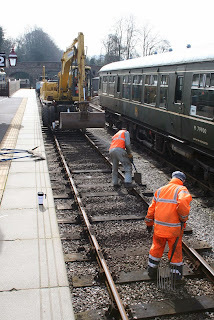 The LCC and assistant have not been idle for too long as they have assessed the former office of Phil Tarry for their cleansing and painting together with a start on the routine cleaning of the Class 119. It was difficult to tease out what treats Barry had in store for her tonight. 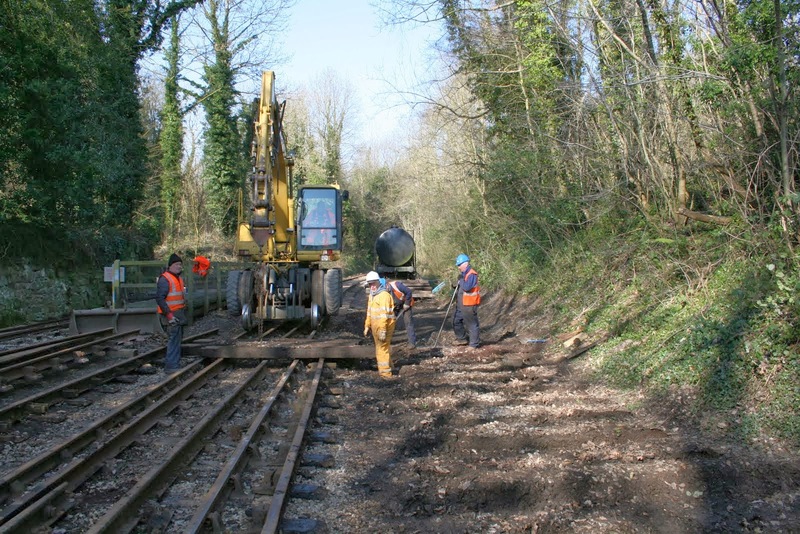 The PWT had another productive day as the RUDD was emptied at the top of the Incline and further trackbed was excavated, and ironwork moved, to allow for both Roads 1 & 2 north of the Cemetery Lane bridge to be restored to use. Lots more work to be done but the clement weather has allowed progress to be uninhibited by the customary unpleasant conditions. The Booking Hall received a flurry of business spurred on by yesterday's email promotion and much research has been done for the market stall weekend. Geoff Clark, who was laid low for a while and is making a good recovery, announced that we have another delightful fly past organised for the vintage bus weekend that will include a Dakota. The Pullman Buffet Car enjoyed quite a good footfall in the Spring like sunshine. 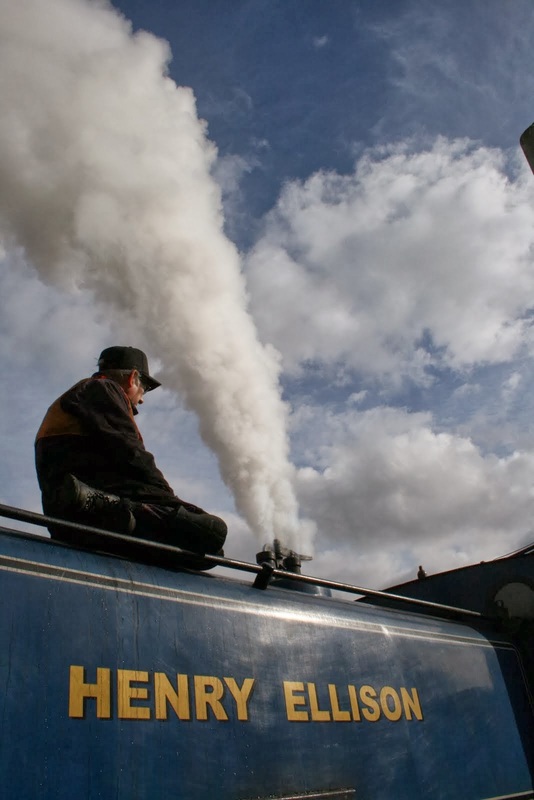 Both steam locomotives were steamed today to establish what was needed to ensure they are ready for 2014 and it is fair to say that some problems were detected that will need further remedial work before they are declared fit for purpose. We have time before our first steam experience day at the end of this month to ensure our promise is delivered. Fred & Iris gave the Mess Hall their traditional "good do" and the FF2 completed the removal of the documentation and furniture to his new location at the north end of the Training Room complex with many thanks to the team that uplifted everything. The VCT had a strangled start to the day by the discovery of a flat tyre on their Landrover necessitating the borrowing of kit from the Station Garage which occupied quite a large part of the day. The dmu team continued to work on the internal paintwork of the Bubble Car and fitted a new battery isolation device to Iris. The Komatsu journeyed to Shottle to assist with further clearance of surplus material from the platform project and returned to Wirksworth for permanent way work tomorrow. The PWT turned their attention to the first of the points recovered from Cemetery Lane as they started the process to "re-hand" it. This means the preparation of the pointwork which will be completely turned round for its new location. It is a little more labour intensive than your average model railway layout. If all works well both the adjustment of Henry Ellison's safety valves and the use of the "Jim Crow" will be illustrated. various tasks. The passenger service tootled up and down in its usual quiet way for this time of year and the Booking Hall staff ploughed through some inevitable administration and a large quantity of statistics. vehicle and is being painted in a historic way, it will need about 15 coats of paint and varnish in the end. 50253 continued with work on the destination box and the cab. Unit 51188 received and completed its "C" exam and was also addressed with a mop. LJ Breeze was greased in parts and the oil was changed in the final of three final drives. JCB Purves carried on with the filling of a trench and the removing of various stones so that the mower can run round the workshop when the grass starts to grow again. display are open on and from this week every day except Mondays. The Talking Tunnel has temporarily expired but will no doubt be talking again once the work on the car park embankment is done. Another cold frosty morning greeted the visitors to Derbyshires friendly railway as 55006 shuttled between Wirksworth and Duffield crewed by Eric and the 2 Richards . By dinner the sun was out and more walkers and visitors were to be found in the pullman buffet. Down the yard the Dmu group were to be refurbishing the 101 as well as replacing the oil on Breeze. Oaks enterprises and the 8f group were busy working on the Duke and sorting out a power supple for the 8fs coach. We hosted another induction day and pts course for our new volunteers in the training room as well as transferring the office down to the old operations office. Evra and Wyvern rail held a joint meeting in the Red Lion to look at all aspects of Operational requirements for this season. A steady start to march and my thanks go out to all .